Introduction: If the old adage that possession is nine tenths of the law is indeed correct, then Mr. Philippe de Villiers, founder of the Puy du Fou historical theme park near Nantes, has clearly won his case for a small silver-gilt ring taken from Joan of Arc by the English Cardinal Henry Beaufort during her 1430-31 imprisonment. The Cardinal was present, and instrumental, in the trial and execution of the Maid of Orleans in 1431, and the ring has remained in private hands in England since that time. The British government claimed that the ring is an object of English national patrimony and thus is subject to an export license in which an English buyer will have the option to block the transfer of the ring to another country. A 2015 law states that any object worth more than £150,000 requires an export permit. This type of art-related law case is not unusual; they appear in the media quite regularly. Nazi reparations, such as the return of the portrait of Adele Bloch Bauer by Gustav Klimt formerly in the Belvedere Art Museum in Vienna to its rightful owners, are the most readily recalled. 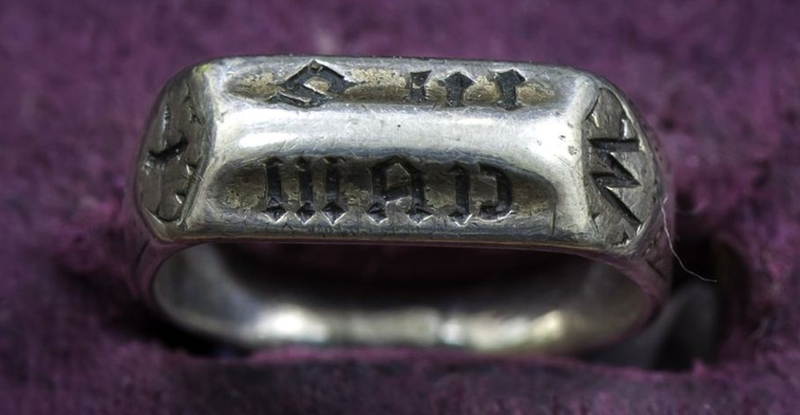 However, what makes this case special is the importance of the historical figure whose possession of the ring is in question. Visually, the object in question is quite modest. It is a simple silver-gilt ring (now silver) without any stones. The only embellishment are some niello filled lozenges and triangles appearing to be three crosses and, on the two rectangular fields of the bezel the abbreviations “IHS” and “MAR”, standing for the names Jesus and Maria. There is some wear to the ring. It resides in a simple wooden casket surmounted by a wooden cross and lined with red velvet that may have been made specifically to hold the ring.